Many of the manufacturers featured on Showcase of Aussie Products are looking to expand their markets – worldwide and in many areas of Australia. They are looking for established distributors, agents, wholesalers, re-sellers to sell their products + entrepreneurs. Products – Rural Products – Animal Drenches, Fertilisers, Organic Products + Gourmet Salts. To explore the “Business Opportunities” available with AJ Products – CLICK HERE. Products – Men’s Swimwear – Briefs & Trunks, Mesh Swimwear, One Piece Swimwear, Thongs & G Strings + Muscle Tops & Singlets. To explore the “Business Opportunities” available with Aussie Togs – CLICK HERE. Products – Footwear – Ugg Boots, Slippers + Skeepskin Rugs. 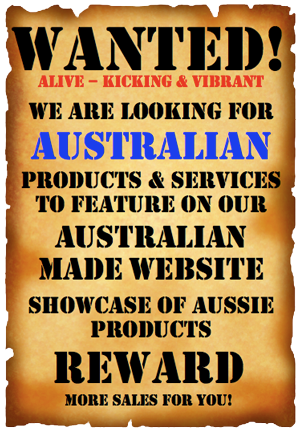 To explore the “Business Opportunities” available with Aussie Uggs – CLICK HERE. Products – Wooden Chopping Boards – Cheese Boards, Cutting Boards, Presentation Boards. To explore the “Business Opportunities” available with Big Chop – CLICK HERE. Products – Women’s Swimwear – Bikinis, One-Piece Bathing Suits, Mastectomy Bathing Wear + Swimwear Cover Ups – Clothing, Leggings, Tights. To explore the “Business Opportunities” available with boobah Swimwear – CLICK HERE. Products – Audio Automation Equipment – Automation Equipment, Best Home Automation System, EASYswitch, ES240-110 Remote Control Of 240/110 Volt Mains Power, Home Automation, Home Automation Lighting, Home Automation Products, Home Theatre Automation Equipment, Lighting Automation Equipment, Security Automation Equipment, Smart Home Products. To explore the “Business Opportunities” available with BOOLEAN ENGINEERING Pty Ltd – CLICK HERE. Products – Dance Apparel – Ballet Costumes, Contemporary Dance Costumes, Hip Hop Dance Costumes, Jazz Dance Costumes, Lyrical Dance Costumes, Theme and Tap Costumes, Tiny Tots Costumes, Separates, Dance Accessories + Studio Uniforms, Corporate Promotion Costumes. To explore the “Business Opportunities” available with Camille Wolfe design – CLICK HERE. Products – Aloe Vera Gels, Antibacterial Sanitising Hand Gels, Barrier Creams, Hand Cleaners, Head Lice Protection, Insect Repellents, Sunscreens, Zinc Creams. To explore the “Business Opportunities” available with Concept Laboratories – CLICK HERE. Products – Gourmet mouthwatering curries for domestic & commercial kitchens. To explore the “Business Opportunities” available with Curry Servers – CLICK HERE. Products – Bush Fire Smoke Masks, Dust Masks. To explore the “Business Opportunities” available with Dane Taylor Technologies – CLICK HERE. To explore the “Business Opportunities” available with Delicake – CLICK HERE. Products – Condiments – Chutneys, Dipping Sauces, Jams, Marinades, Mayonnaises, Oils, Pasta Sauces, Pickles, Relishes, Salad Dressings, Sauces, Seafood Sauces for domestic and commercial kitchens. To explore the “Business Opportunities” available with Emelia’s – CLICK HERE. Products – Environmental & Spillage – Absorbent Pillows, Absorbent Socks, Aquatic Silt Curtains, Bio-Hazard Absorbents, Dewatering Bags, Marine Containment Booms, Portable Containments, Silt Socks, Spill Solutions, Spill Treatments, Vehicle Wash Mats, Weed Booms, Weighted Drain Covers. To explore the “Business Opportunities” available with Enretech Australasia – CLICK HERE. Products – Chai – Authentic Chai Tea. To explore the “Business Opportunities” available with Hari Har Chai – CLICK HERE. JEEERKS also offer “Private Labelling” of these products. To explore the “Business Opportunities” available with JEEERKS Pty Ltd – CLICK HERE. Products – Skincare Products & Cosmetics. To explore the “Business Opportunities” available with JIV.ELAN Pty Ltd – CLICK HERE. Products – Homeopathic – Acne Range, Cream Range, Family Essential, Magnesium Deodorants, Magnesium Lotion Range, Magnesium Oil Range, New Mums & Females, Rapimend Gel Range, Sports Injury Range, Teens Emotional Range, Tiny Tots Range, Travel Pack. To explore the “Business Opportunities” available with Natural Aid Pty Ltd – CLICK HERE. Products – Blueberry Wine, Raspberry Wine. To explore the “Business Opportunities” available with Northern Slopes Plantation – CLICK HERE. To explore the “Business Opportunities” available with OZPLUM – CLICK HERE. Products – Surfboards – Basla wood, Foamcore, Waxs, Zinc Cream & Surfing Accessories. To explore the “Business Opportunities” available with Riley Balsa Wood Surfboards – CLICK HERE. Products – Goats Milk Soaps – Soaps, Air Fresheners, Body Toners, Ex-Foliating Bars, Hair Conditioners, Shampoos, Pet Soaps. Soap Creations & Body Care will also “Custom make” Goats milk products to your requirements. To explore the “Business Opportunities” available with Soap Creations & Body Care – CLICK HERE. Products – Bio products – Compost Enhancer, Pest Control in Garbage, Smelly Drains, Smelly Grease Traps, Smelly Pet Waste, Smelly Septic Tanks. To explore the “Business Opportunities” available with Solutions Unlimited Australia Pty Ltd – CLICK HERE. Products – Women’s Micro Swim Wear – Bikini Tops & Pant, One-Piece, Mesh & See-Through/Sheer Swimwear + Micro Cover Ups. To explore the “Business Opportunities” available with sunbabe Swimwear – CLICK HERE. Products – Sunscreens – After Sun, Aloe Vera Gel. To explore the “Business Opportunities” available with Sunsational Body Care – CLICK HERE. Products – Full bodied natural simmer sauces for commercial kitchens. To explore the “Business Opportunities” available with SYDNEY SAUCE Co – CLICK HERE. Products – Footwear – Slippers & Ugg Boots + Lanolin Creams, Coin Purses, Cosmetic Cases, Hand Bags, Makeup Bags, Innersoles, Sheepskin Gloves, Sheepskin Rugs. To explore the “Business Opportunities” available with UGG Since 1974 – CLICK HERE. Products – Sauna Massage Machines for domestic & commercial use. To explore the “Business Opportunities” available with VIBROSAUN – CLICK HERE. Products – Jeans – Men’s, Women’s + Leather Belts. To explore the “Business Opportunities” available with VIGGOR – CLICK HERE. To view the current Businesses for Sale – CLICK HERE.